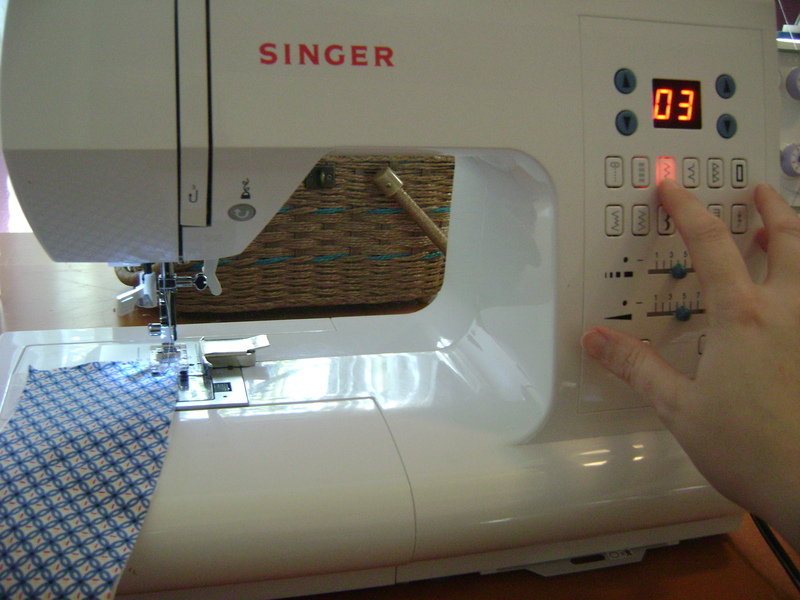 Each month I get to host BabyLock Club at Humble Sewing Center…. Today we had several sweet ladies who braved the storm to attend this fun and FREE monthly meeting. We had a great time getting to know each other, sharing sewing stories, exchanging tips and ideas as well as making a little mischief…. You see, I decided to demo how to revamp an over-sized t-shirt into something more figure flattering and also how to modify the neckline. Everything was innocent enough except, the only available shirt in my home happened to belong to my husband and it did happen to be one of his FAVORITES. Ooooops! Please look closely and notice the bleach stain at the bottom hem of this shirt…. 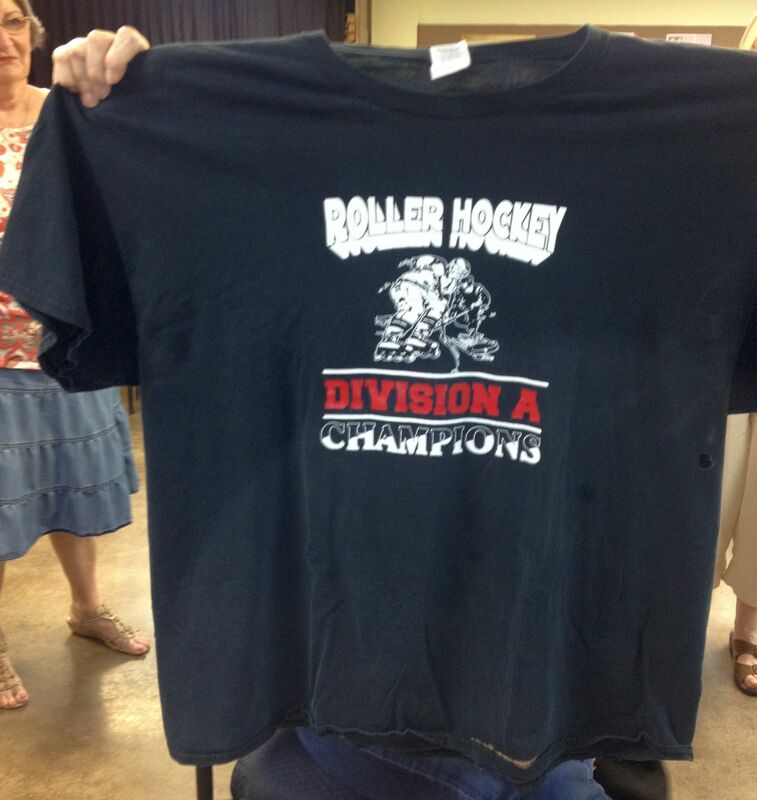 and also the torn hole to the far right of the word Champions. Oh yes, this shirt was officially in need of a make-over. I chose the Peek a boo neckline – which you will see in just a moment. I used the embroidery machine and sewing machine for the neckline changes and I used the Makeover pattern with a serger/cover stitch machine to re-size, re-shape, and hem the shirt. It was EASY! I could have used the sewing machine for the entire project but, the serger made it so much easier to get the results I wanted. At the end of our meeting, I was a little nervous about telling my husband what I had done and a couple of the ladies suggested I show him what I did to his favorite shirt in a way that would appeal to him. I hope he likes what I did cuz’ it’s MY favorite t-shirt now! This entry was posted in Classes, Clothing, Project Tutorials and tagged serger club, t-shirt makeover on September 18, 2014 by Jenny Gabriel. A lot of blogs I read participated in the Pyjama Party online yesterday. I showed up a day late and made an old standby – McCalls 5248 pajama pants out of seer sucker. I wear my flannel pants all the time, but it is getting hot, and flannel is no longer practical. One thing I always wish my pants had was pockets, so this time around I added some. Sorry for the grainy photo. 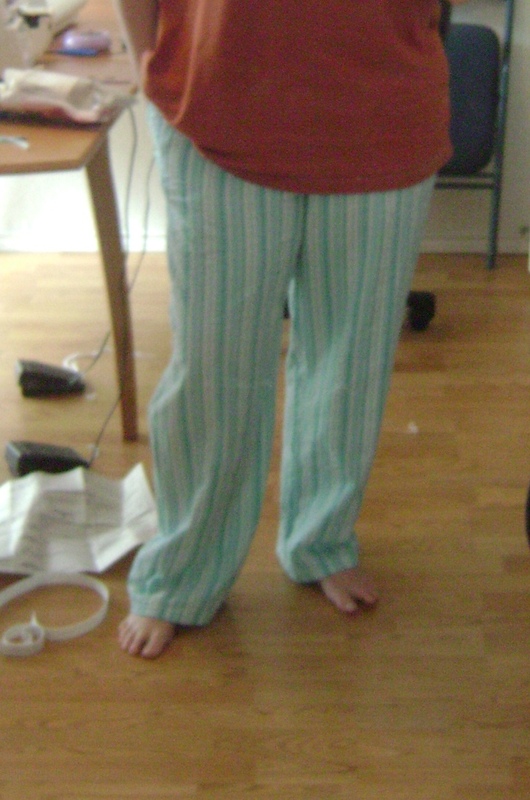 I just couldn’t bother anyone to take pictures of me in pajamas today. I started with the pattern for the pocket from a dress I really like. 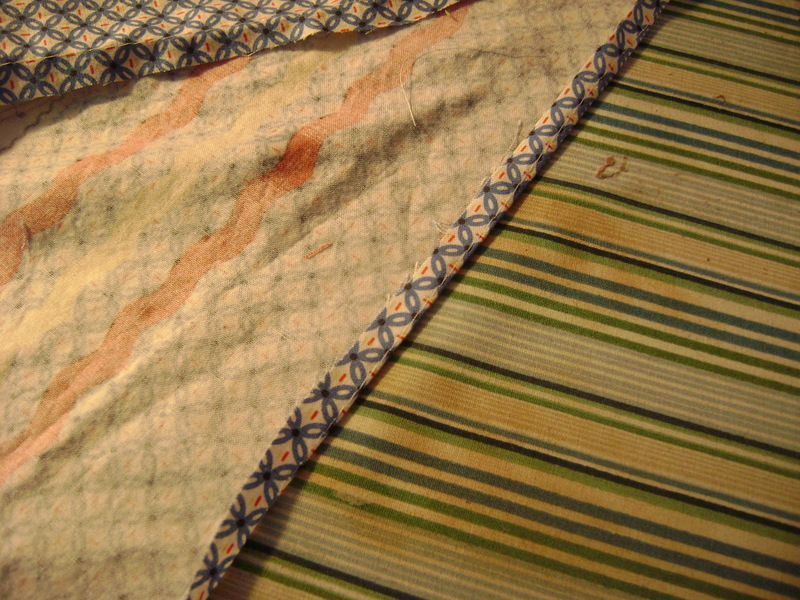 I cut the pockets out of quilting cotton because seer sucker pockets would get bulky. Cut 4 – two for each side. Next I laid my fabric pieces out right next to each other and lined up the tops straight across. I measured down four inches from the top and made a mark on my pattern on the outsides of both legs. 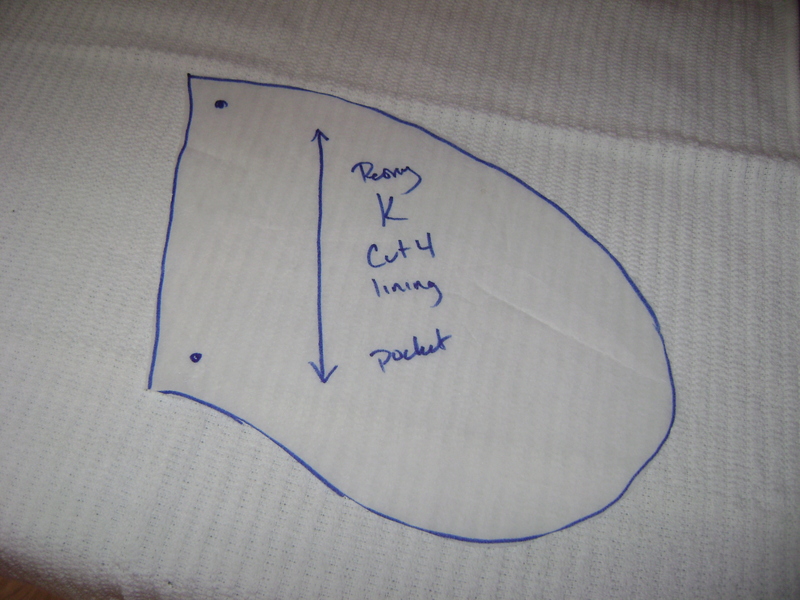 I lined up the top marking of the pocket with my 4″ line and also marked the bottom mark of the pocket on my pattern. Next I marked both marks on all four pieces of fabric. This pattern has you sew the inside leg seam firt, so I did that. 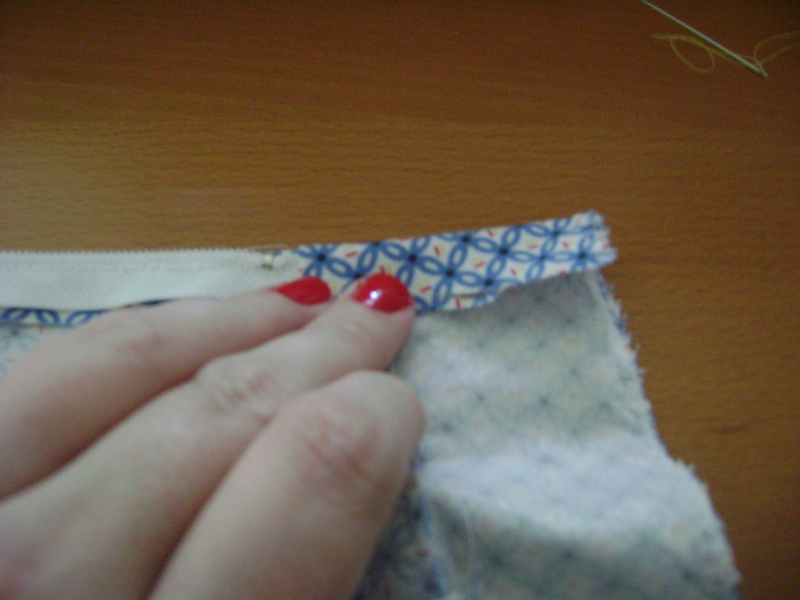 But I added a couple steps before I sewed the outside seam. 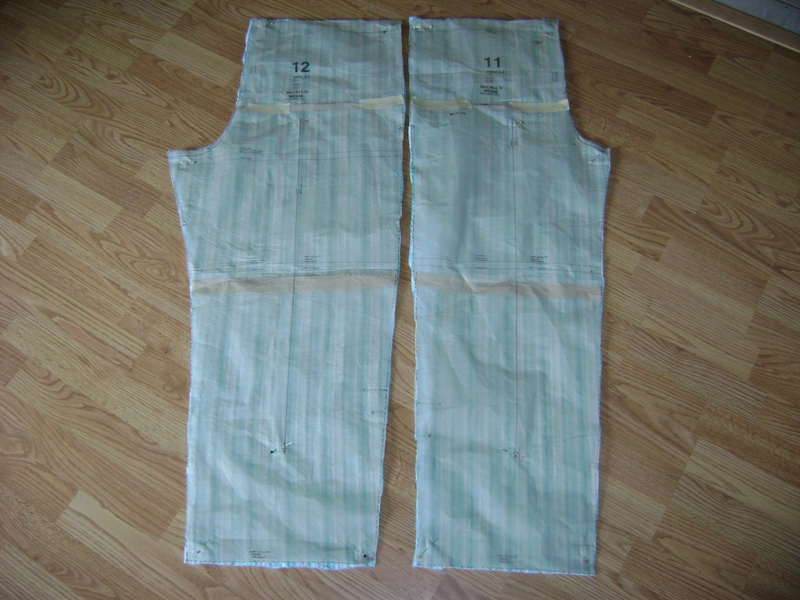 My pattern called for a 5/8″ seam allowance, so I sewed the pockets right sides together with the fabric using the same on both front and back pieces. I zigzagged along the edge of the raw edges of the pockets and fabric. I pressed both the pocket and seam allowance toward the outside. You should now have two pieces that look like this. 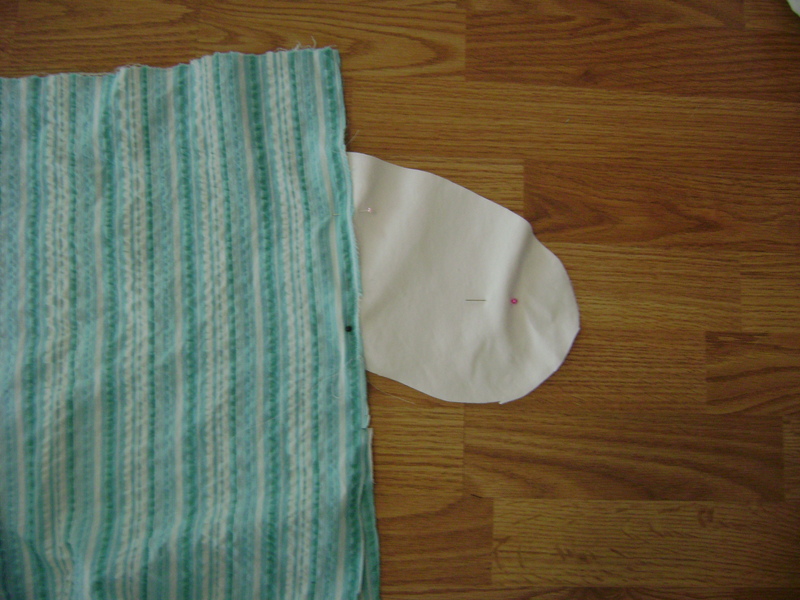 Next my pattern directs mt to sew outside leg seams together. 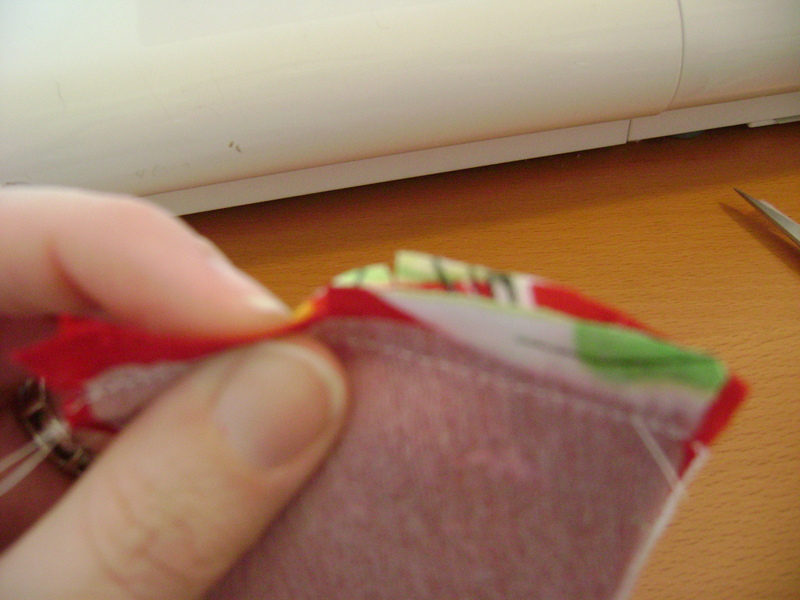 I like to pin the seam allowances together as well as a pin in the center of the pocket to keep everything in place. Now sew down the leg seam from top to bottom with right sides together going around the perimeter of the pocket instead of going straight down the leg. 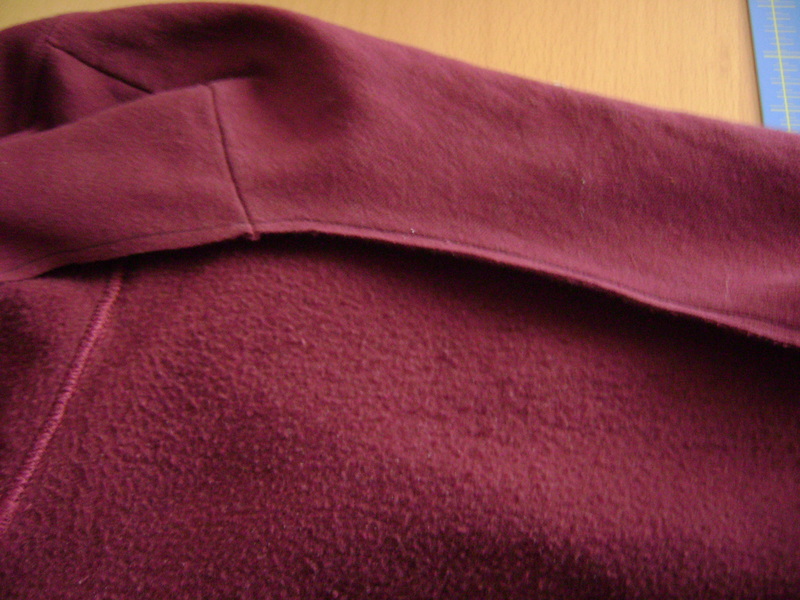 I serged around the edges to finish the seam, but as you can see the pocket is not perfect. It is trying to serge curves like that. I’m OK with it. I like to stick my hand in the pocket at this point for a finger check. That means do my fingers find any holes that I may have left in the pocket. All clear! Now continue sewing as directed! I will be giving a new McCalls 5248 pattern away on my blog, so be sure to visit there. 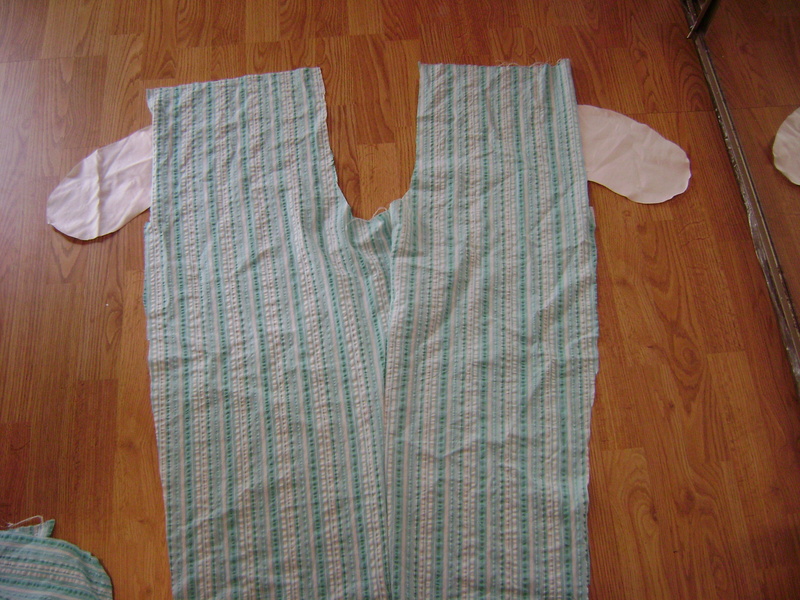 This entry was posted in Clothing, Project Tutorials, Sewing FYI and tagged adding inset pockets to pj's, pockets tutorial on April 29, 2012 by staciethinks. It is already hot in Texas. Yesterday my thermometer read 86 degrees! I work in a school where when the temperature goes up outside, the air conditioner gets turned way down. It is summer outside and winter inside. One of my favorite people at work gave me an old school sweatshirt and asked me if I could make it into something that was open she could slip on when the temperature drops in her office. Challenge accepted! 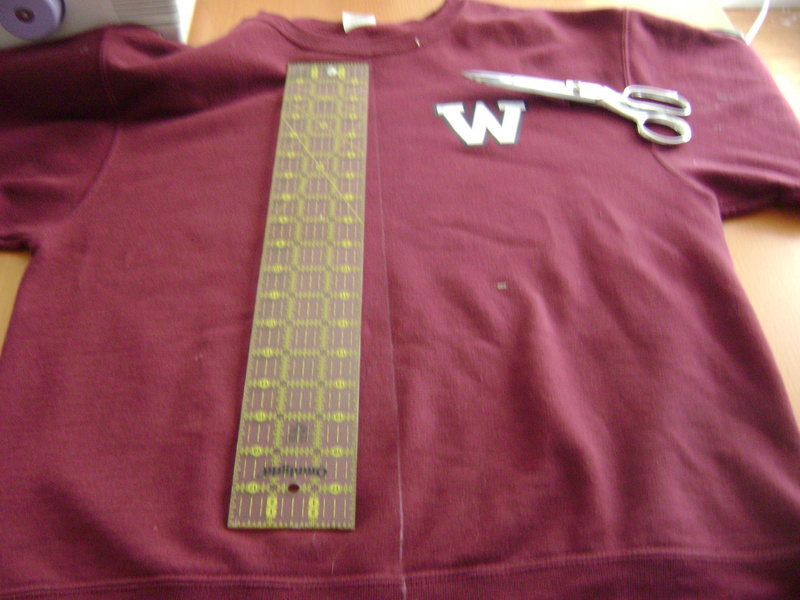 I started by drawing a line down the center front of the sweatshirt and cutting it straight down the front. Scary! I told her to give me an old sweatshirt in case I messed it up, but I had to cut sometime. Next I cut the neck band, waistband and sleeve cuffs off just below their stitching line. I stay stitched the neckline to keep it from stretching while I was working with it. I turned the sweatshirt inside out and pinned the fabric in place. 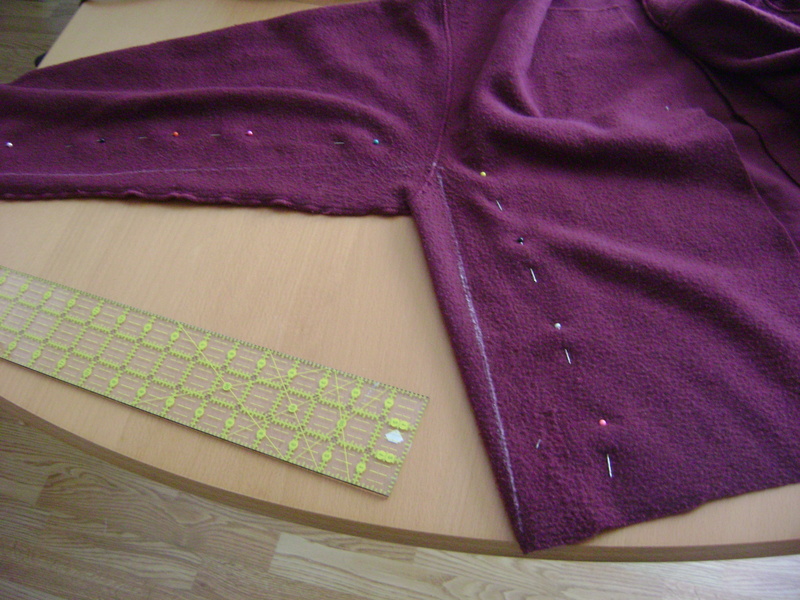 I serged my sleeve and side seams, so I pinned well inside my seam allowance. I measured in from the arm pit two inches and tapered that mark into the bottom of the shirt as well as the end of the sleeve. Repeat this on both sides. I did this because I find most sweatshirts are baggy in the arm which is very comfortable, but not flattering as a cardigan feature. Here are my new serged side seams. Finally, I used Jenny’s great binding tutorial to finish all of the raw seams. Yes, hers is on a place mat, but it is the same general idea. Our school colors are maroon and blue. 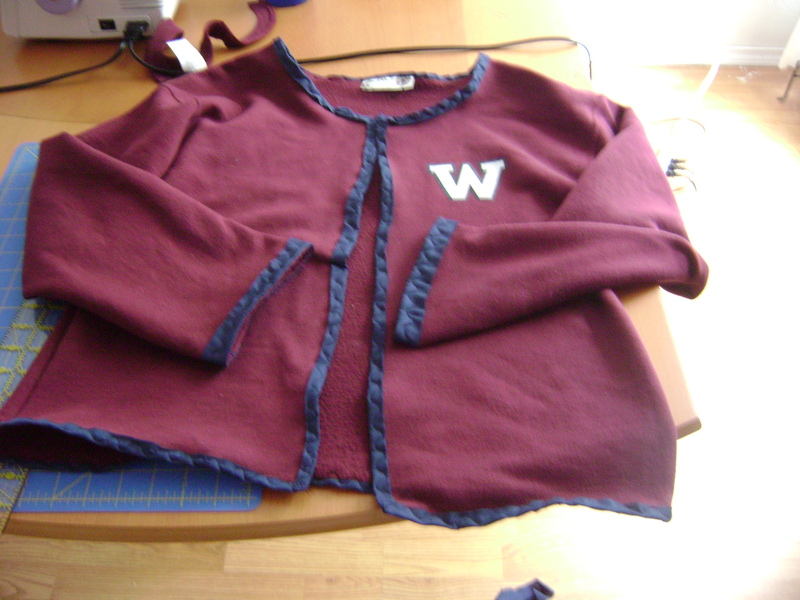 Now I have a cute and boutique style cardigan from an old sweatshirt! I used my curvy decorative stitch, but I would recommend one with a bit more substance if you are going to try this project. What a great present for teachers or cute project for students! 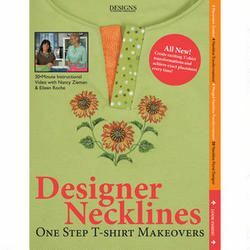 You could also add a button or hook and eye at the neckline to keep it closed if you wanted to. 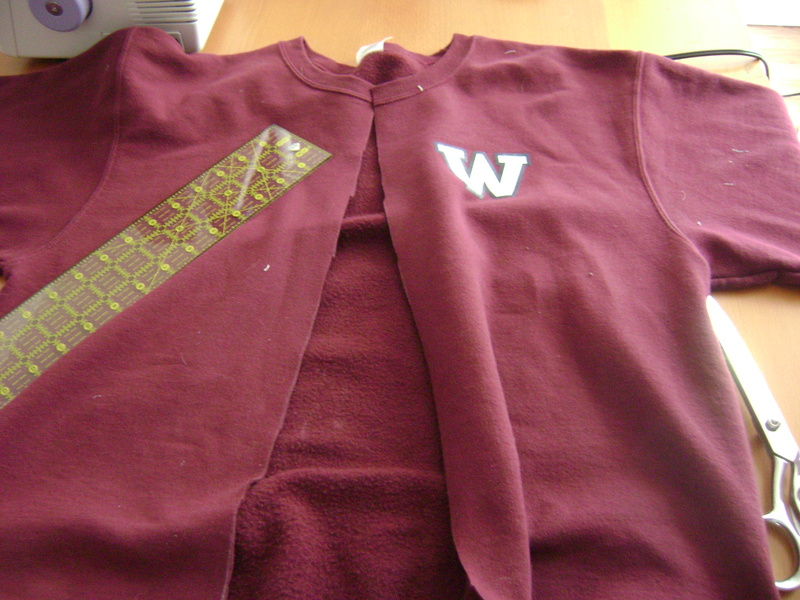 This entry was posted in Clothing, Project Tutorials, Sewing FYI and tagged sweat shirt make over, transform a sweatshirt on April 1, 2012 by staciethinks. All we have to do is hem our skirts and we are all done! 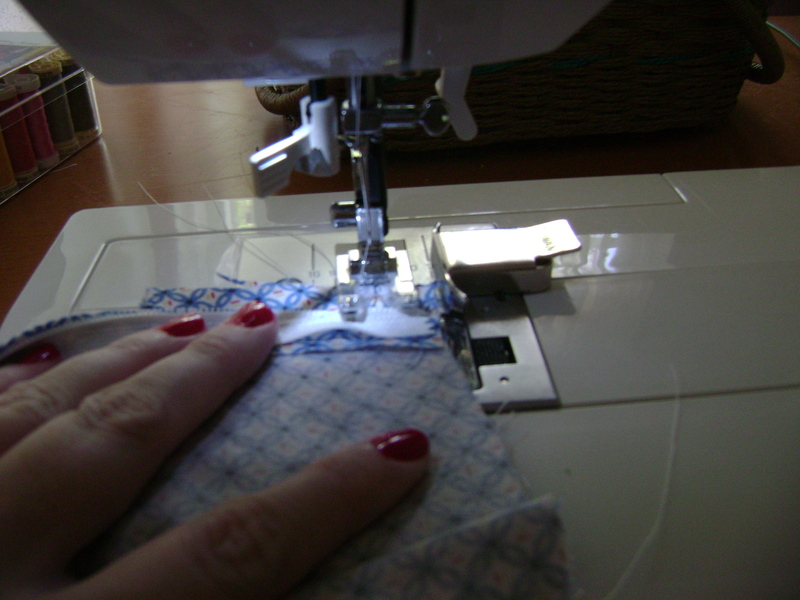 I chose to hem the blue skirt using my sewing machine and use a hem facing to start hand stitching my pink one. You can choose either method. 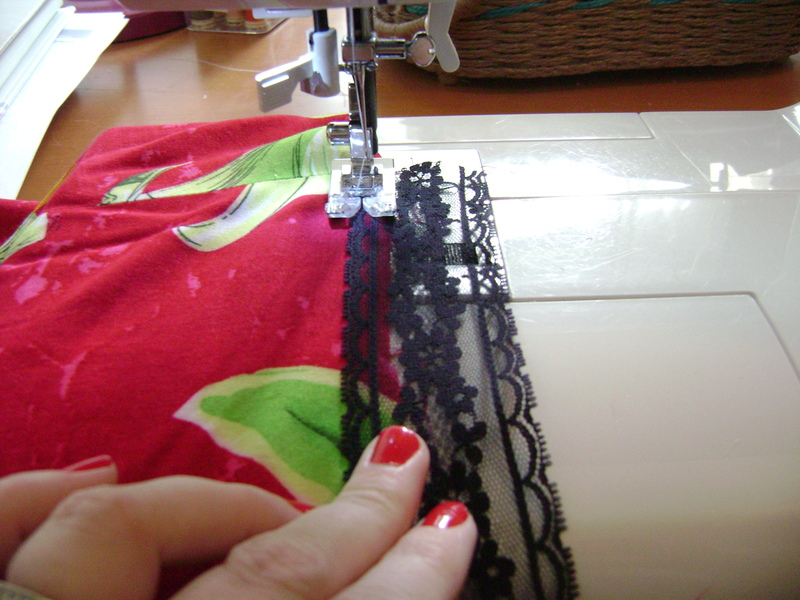 The hem I most often use is just a simple machine stitch which we will go over first. 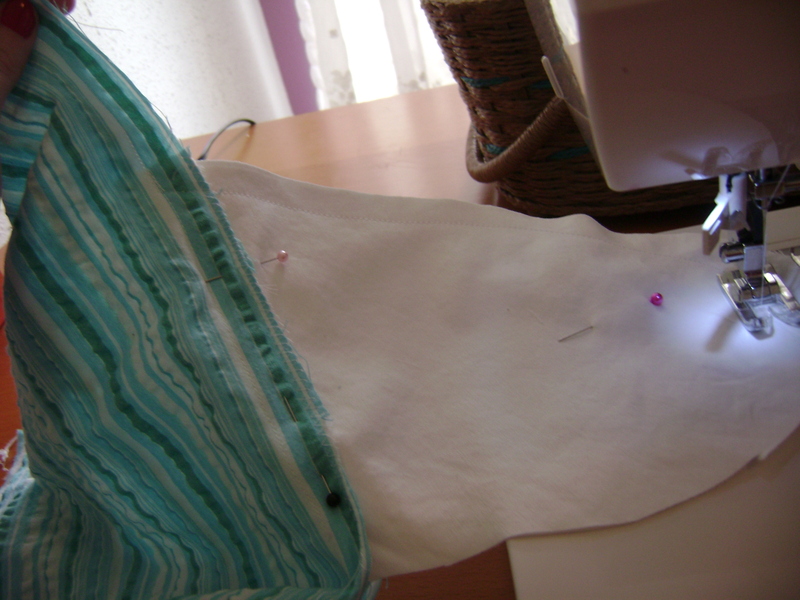 First I like to use a long basting stitch to go around the hem of the skirt. 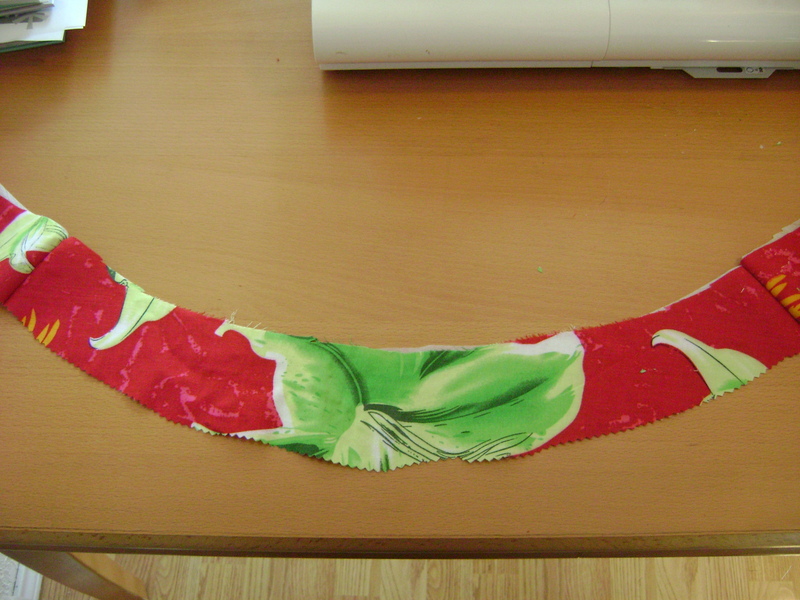 I am using a 1/2 inch seam allowance here because I want my final hem to be 1 inch to allow that fun border to show. 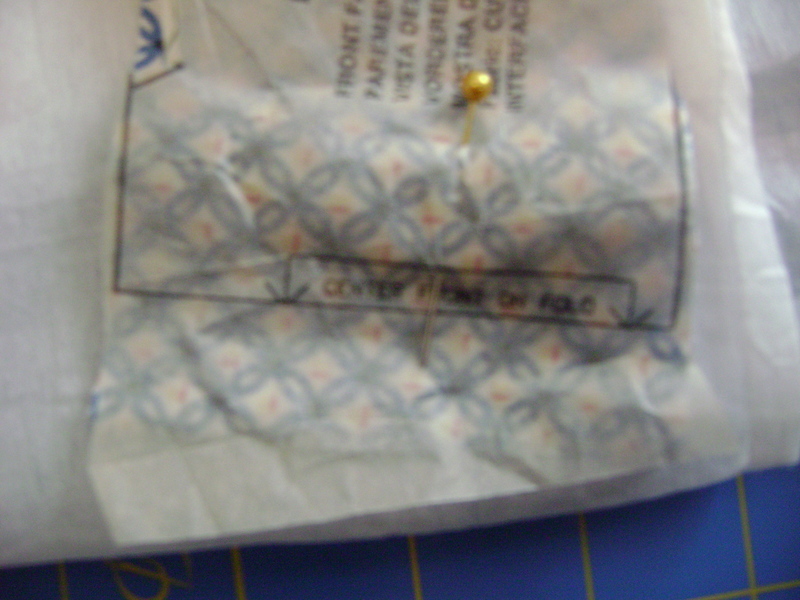 Next I like to press the raw edge up so that the stitch I just made is at the bottom as seen in the picture above. Next I press that piece up again so that the basting stitch is at the top of the hem. Press it all down nice and flat. 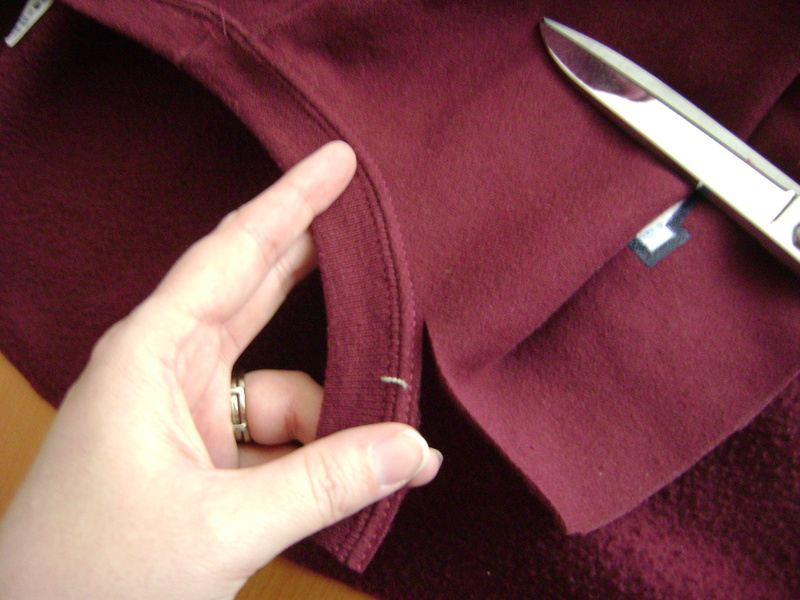 Just shorten your stitch from the basting length and go all the way around the hem. I found this method gives me the best results and the most even hem. You’re done! Now to sew a blind stitch by hand. I admit I don’t do this often because I just don’t have the patience, but it does make for a nice finish and a pretty inside. 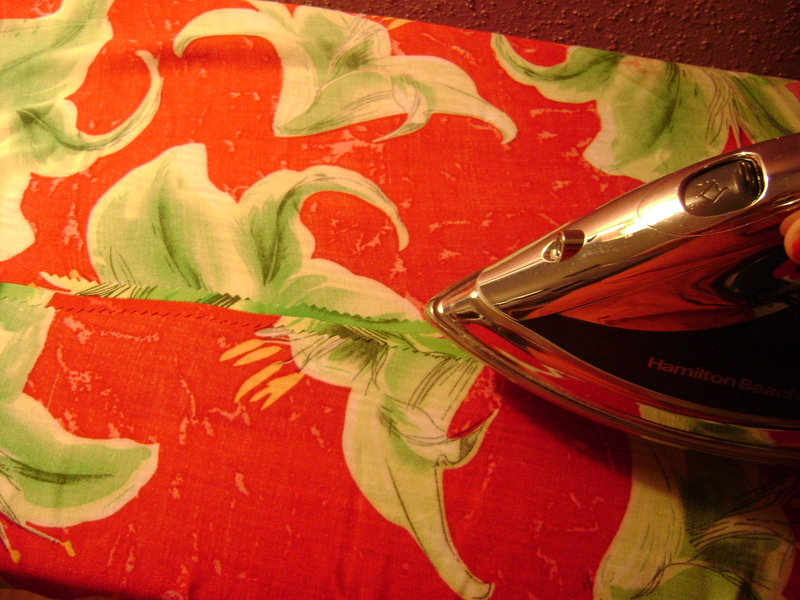 Start by sewing your hem facing all the way around your hem. I used a zig-zag stitch. Sew it to the right side of your fabric. You will fold the lace up and do a stitch as shown above catching the lace and catching just a few threads of the main fabric. I am using non matching colors of thread to help you see better, but you will want to choose a thread that matches your skirt fabric. 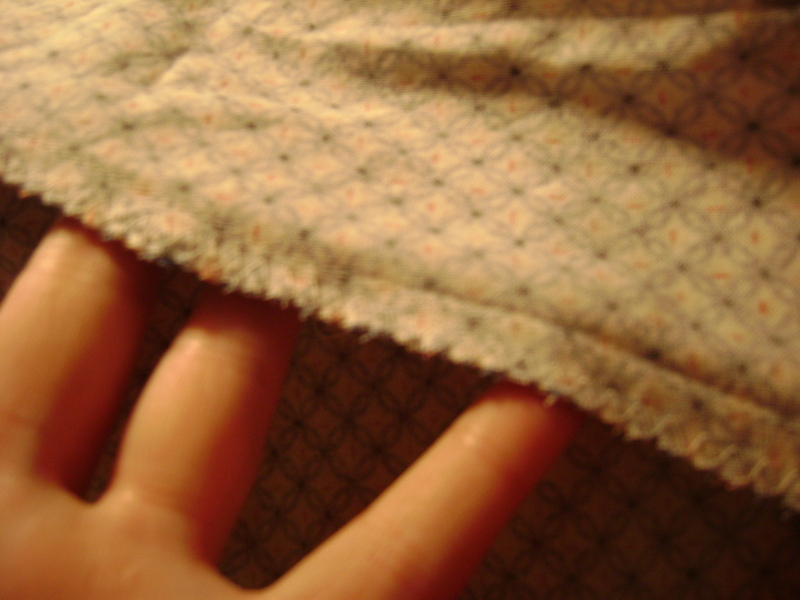 Your stitches will be barely visible from the outside as shown above. That is why matching thread is important. Now a final result! I have the blue one fully completed and just need to find a matching thread for the pink skirt to hem it. Ta-da! I think it turned out very cute. Don’t mind my two different colored legs, I had surgery done on one a few weeks ago. 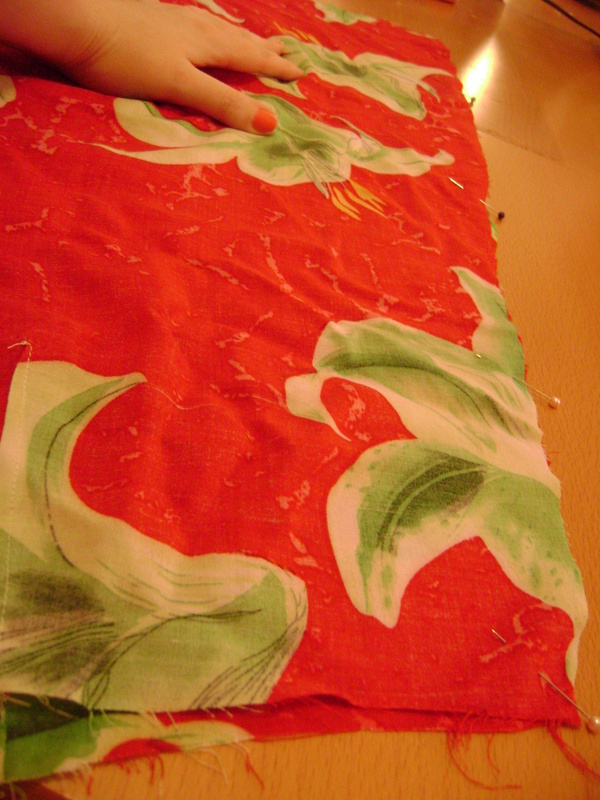 I am favoring one which makes the hem look crooked. I did double-check it for accuracy though. I can’t wait to see any versions that were completed out there. Thanks for sewing along! This entry was posted in Clothing, Project Tutorials, Sewing FYI and tagged blind hemming tutorial, machine hemming, skirt hems on March 25, 2012 by staciethinks. It is time to finish our waist facing. The directions will be the same no matter what seam finish you are using. 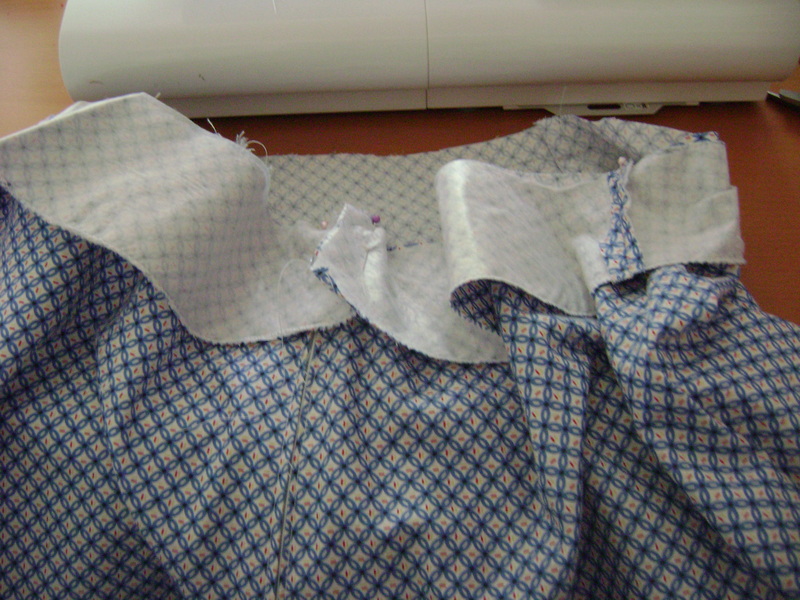 Start by pinning your facing pieces right sides together with your main skirt pieces matching side seams. Finish pinning all the way around. You should have a bit overlapping the zipper. Do not cut that off. Sew using a 5/8 inch seam allowance. Be sure to watch your zipper. If you have any metal pieces at the top do not go over them with your needle. Because those metal pieces can break your needle. 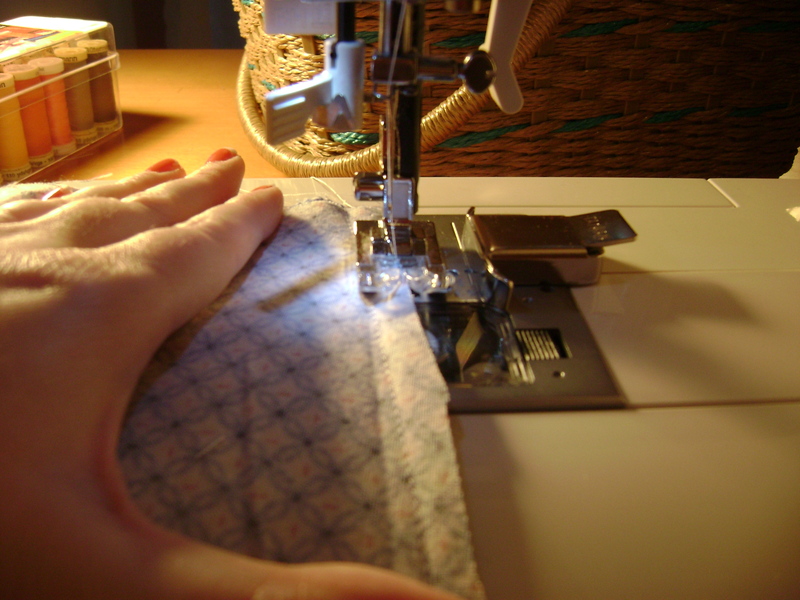 Next you will under stitch the facing to the seam allowance you just created. This will stop the facing from rolling up as much as it could when you are wearing the skirt. Go all the way to the other end doing the under stitching. 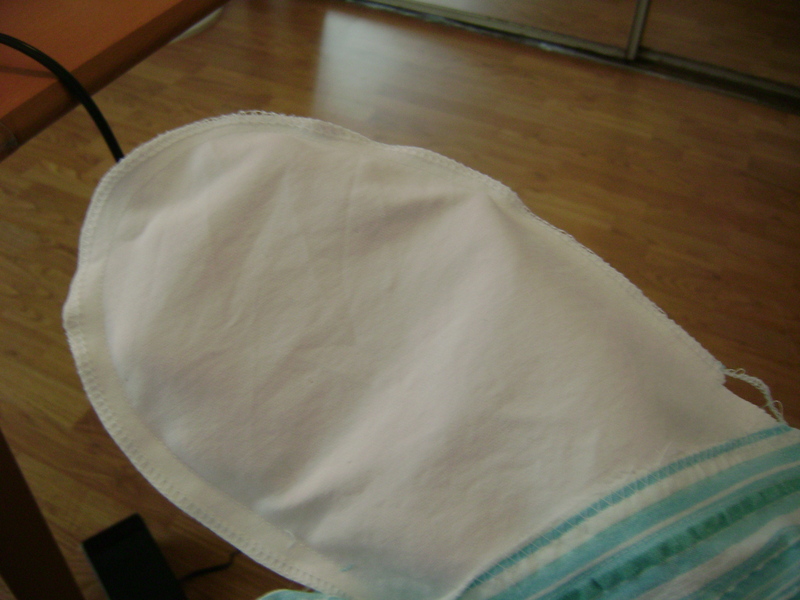 The under stitching will not be visible from the outside of the skirt, and will really help you prevent facing mishaps. Now press the facing down all the way around the waist band. When you look at your zipper you should see some overlap like mine in the picture above. 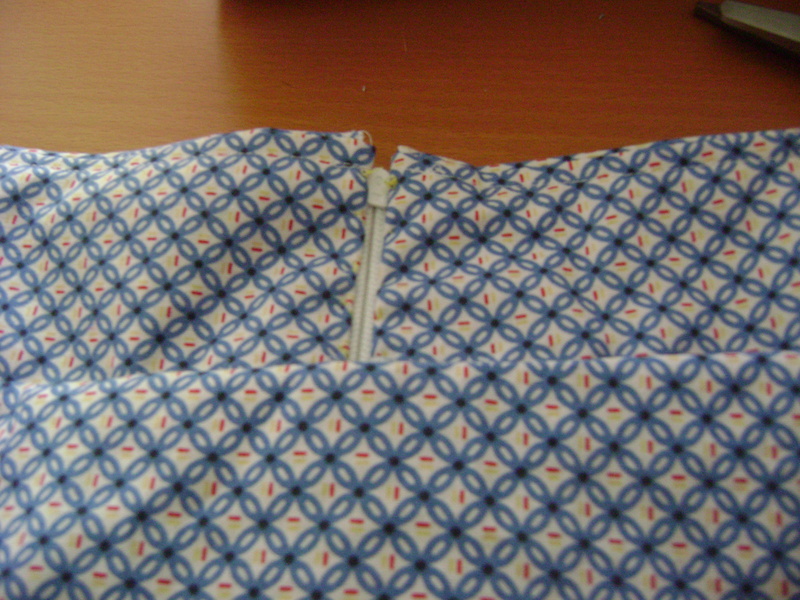 Fold the overlap so it is even with the zipper. Now fold it down so that just the zipper teeth are showing. We will have to hand stitch it down. 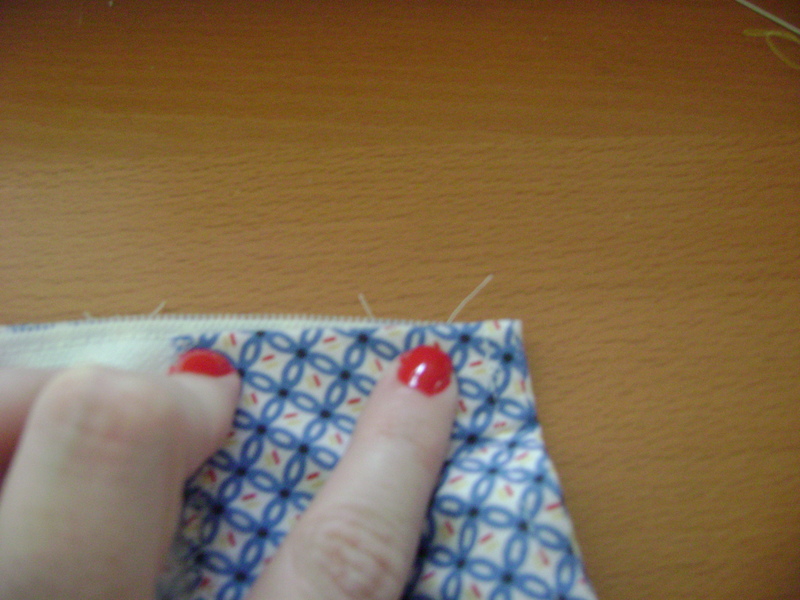 I like to hold it the area in my left thumb and fore finger and stitch using my right hand. 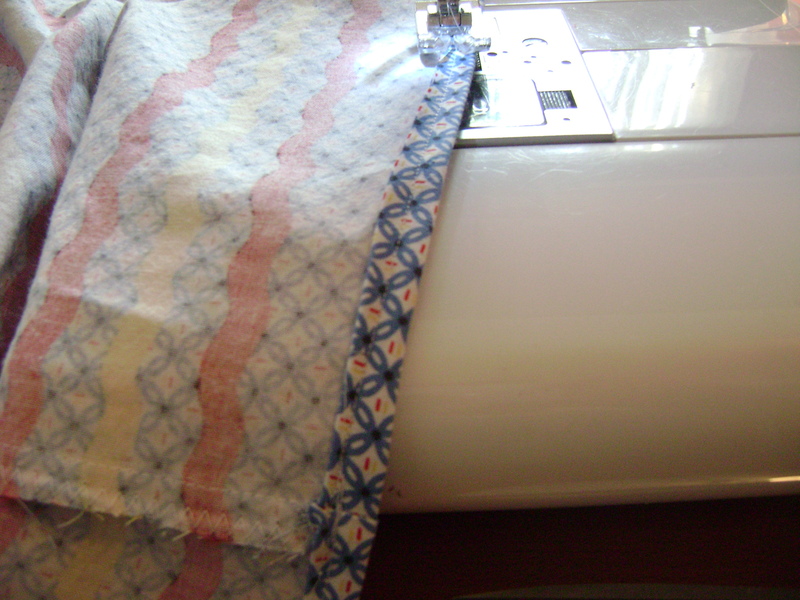 I use a stitch that I also use to bind quilts. I stitch just through the zipper tape and facing piece, not through the outside skirt panels. 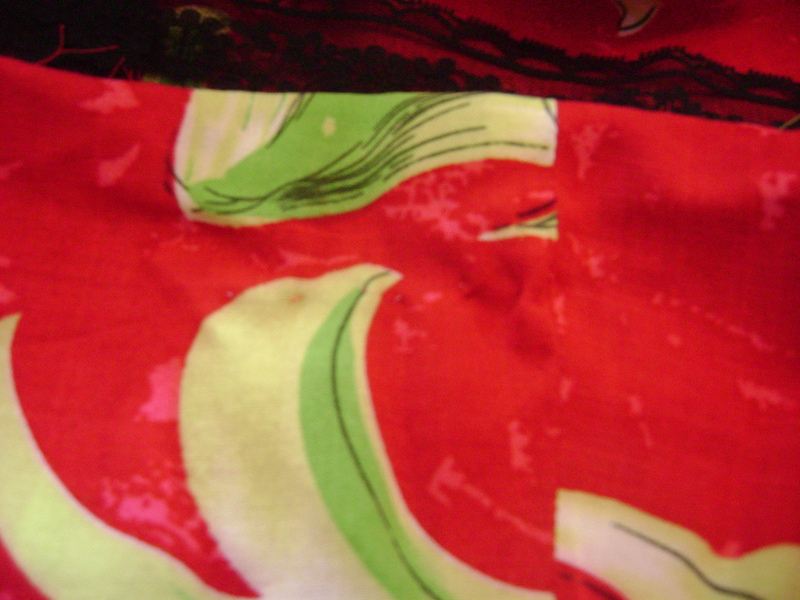 This fabric is so hard to photograph up close! 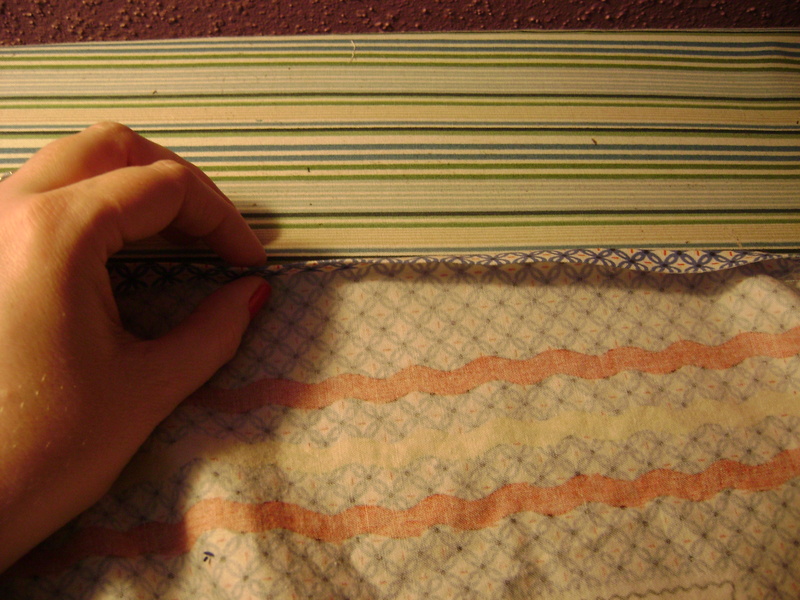 But I pull me needle through the fold in the fabric making it invisible except for a small stitch that will show. This is what my finished facing looks like. All you can see are my yellow finishing knots up near the zipper head. Here is the back of your skirt from the outside. Nice work! Now all we will need to do is hem the skirt. 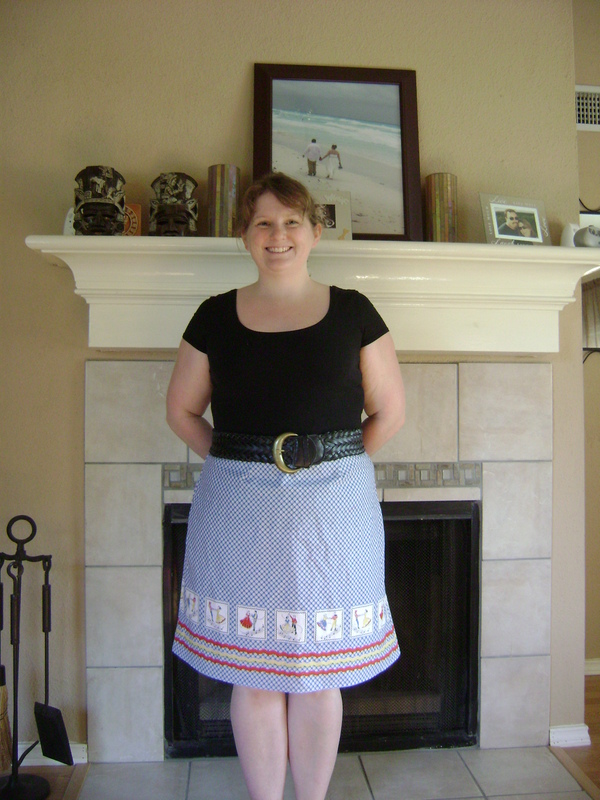 This entry was posted in Clothing, Project Tutorials, Sewing FYI and tagged sewing facings to skirt on March 24, 2012 by staciethinks. The facings in this skirt are easy to put together, but we will take it one step at a time. You will follow the waistband steps as directed below until I let you know we will use different finishing methods. 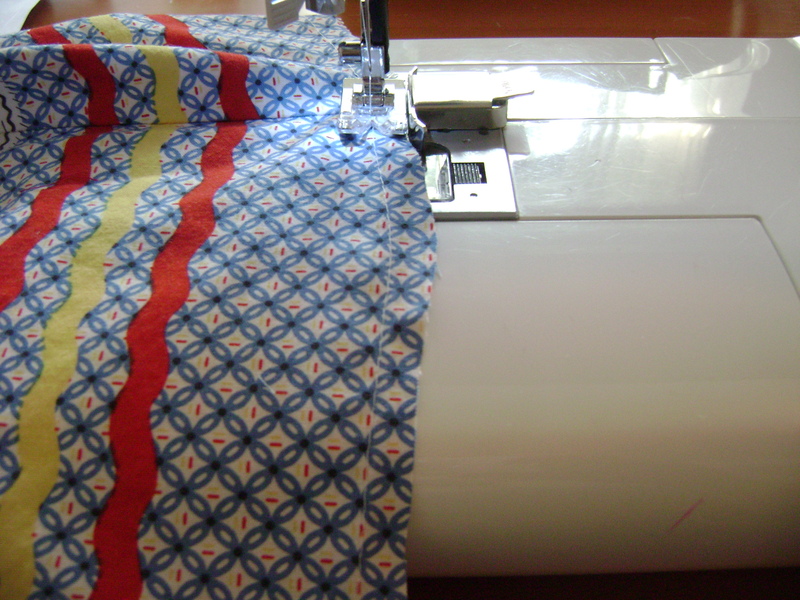 Your fusible interfacing should look something like mine. 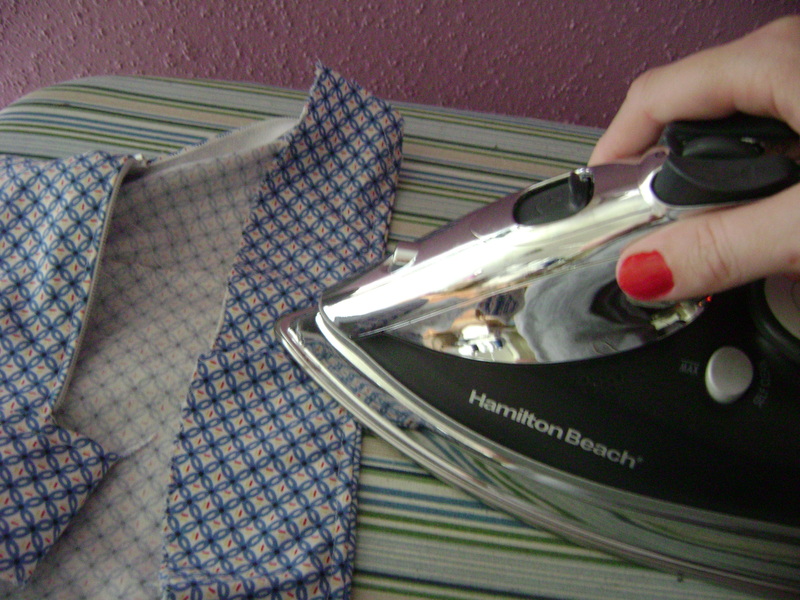 While the need to prewash your interfacing is debated, I will share that I do like to wash mine. I wash them as I would my garment and then hang them over the curtain rod to air dry. 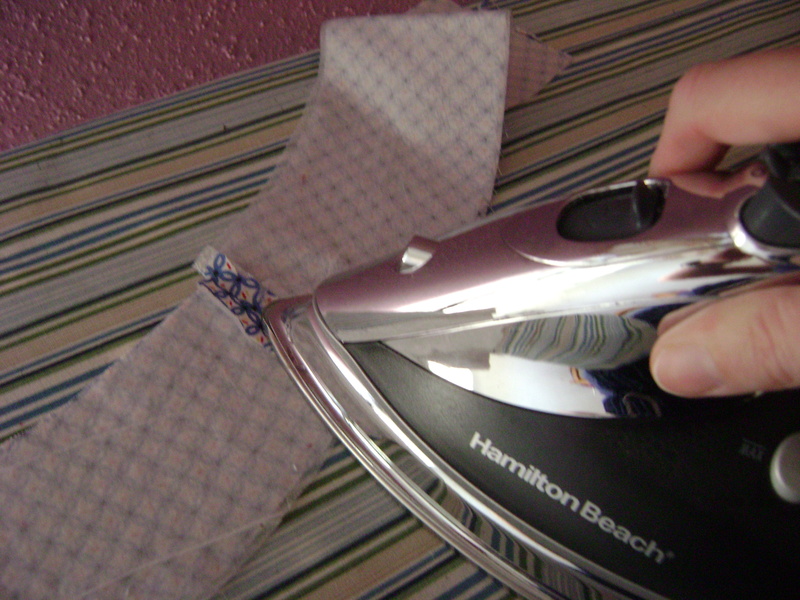 DO NOT put it in the dryer when pretreating as the fusible interfacing is covered and heat activated glue dots. I don’t know exactly what would happen, but I doubt it would be good. Some people don’t treat theirs at all. It was hard to catch this shot, but you will cut your interfacing as you would your fabric. I like to cut mine in a way that uses as little space as possible because I buy the fusible interfacing in large amounts when it is on sale. 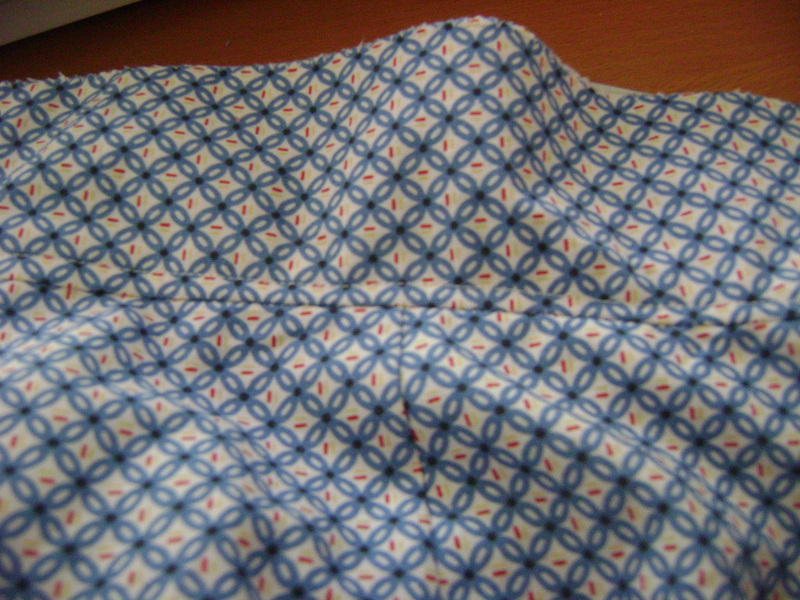 To make a fold, I just fold the interfacing wherever I think it will fit best. 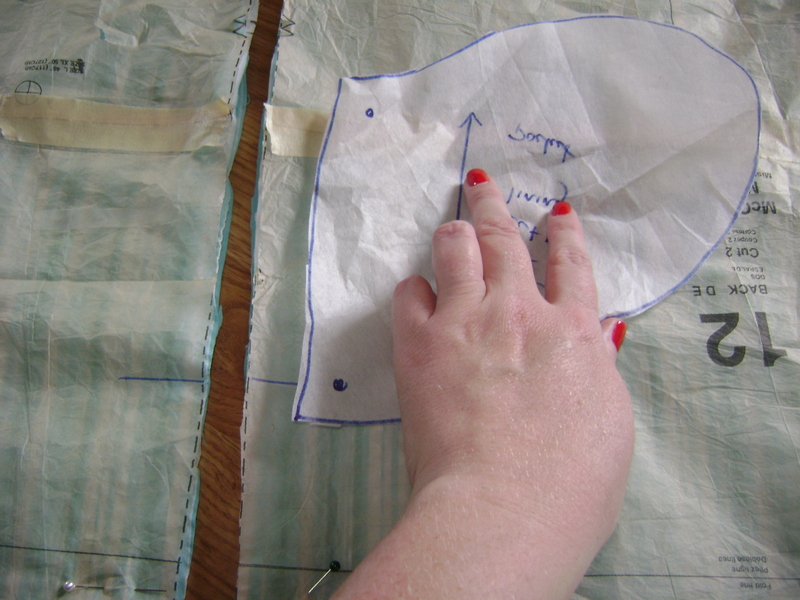 Your pattern piece tells you how many pieces you will need of interfacing. You will cut pieces for both the front and back facing pieces. I like to lay my fabric face down first. 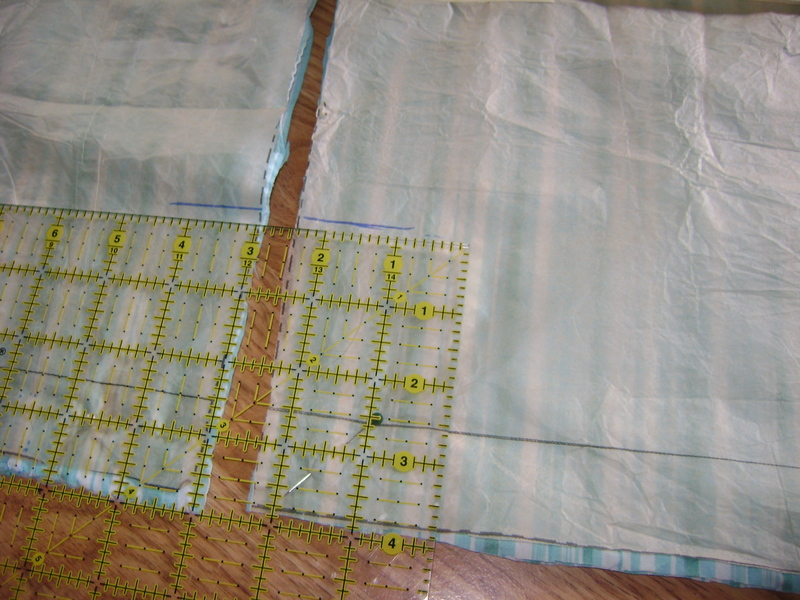 Then I examine my interfacing to find the side that has bumpy dots; that is the glue. 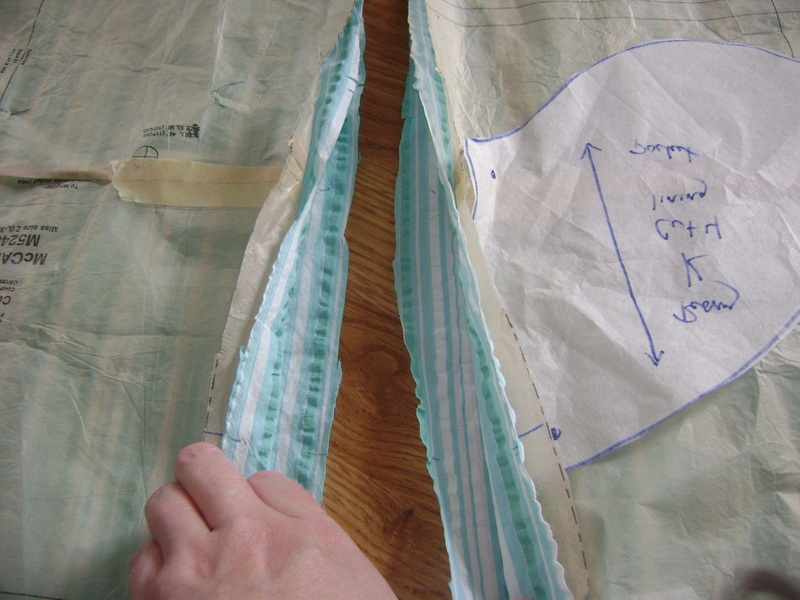 The glue side of the interfacing needs to be against the wrong side of your fabric. 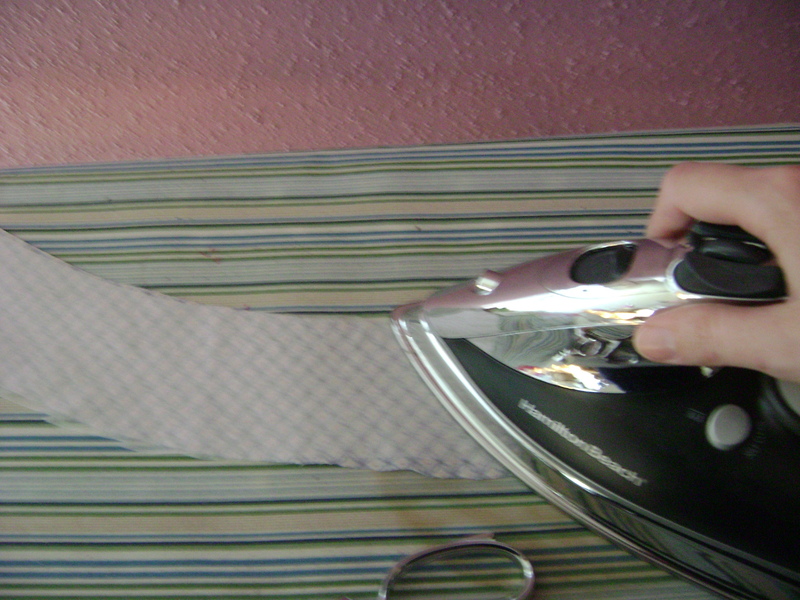 If you put the glue side up, it will stick to the iron. 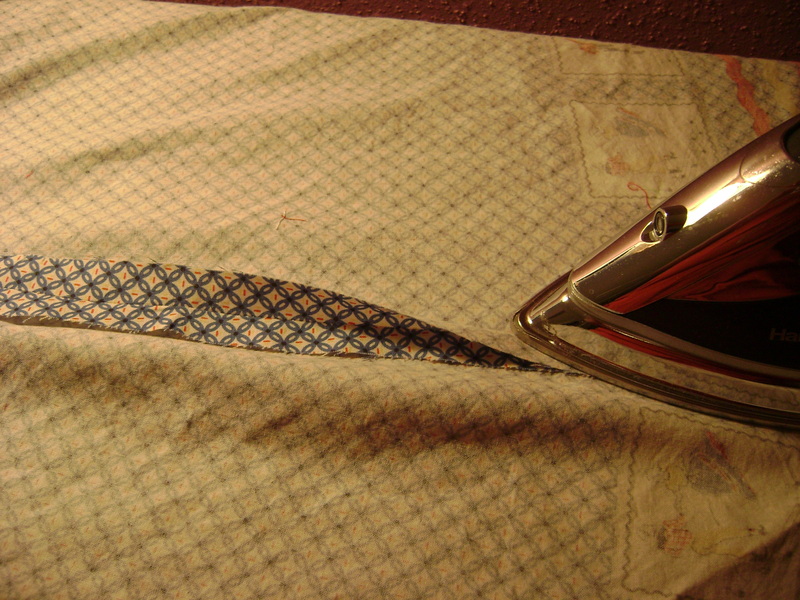 Next, Use the iron on the setting you use for your fabric and press the interfacing into place. Go slow and really let that glue melt. 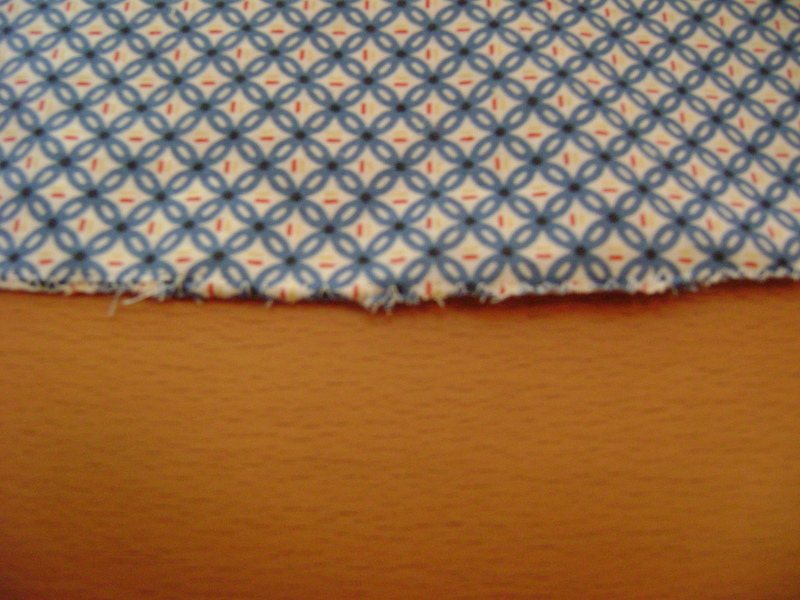 After that your fabric and interfacing should be stuck together like one piece of material. Next we will sew the pieces together. I use my notches to help me get it right as shown in the blurry picture above. Match the notches on the end of the waist pieces and sew using 5/8 inch seam allowance. Repeat on both sides. Go press your seam allowances open. Your waist facings should lay out and form a smile, Or that is how I think about it. If you are pinking shear finishing your edges, trim along the bottom of your smile (facing piece) as shown above. If you are zig-zagging your edges, You will zig zag along the bottom of your smile. 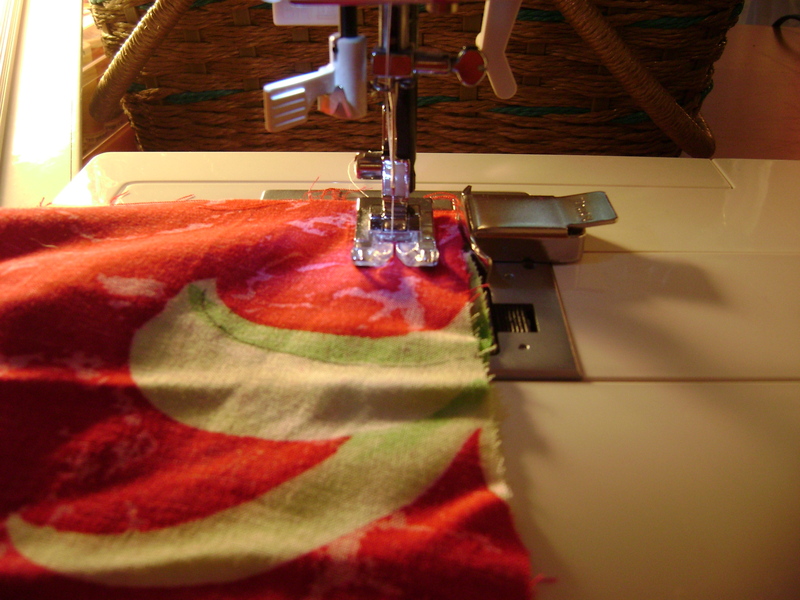 Select your zig-zag stitch and catch that bottom edge of your smile. Your zig-zagging, should look something like mine above. You have finished your facing pieces! 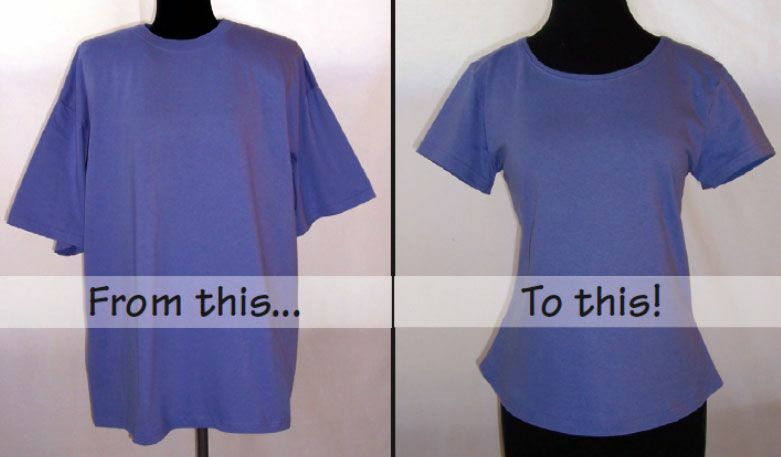 This entry was posted in Clothing, Project Tutorials, Sewing FYI and tagged garment facings, sewing tutorial on March 22, 2012 by staciethinks. I love this step in the process. Once you sew the front and back pieces of the skirt together, it really starts to look like a skirt! 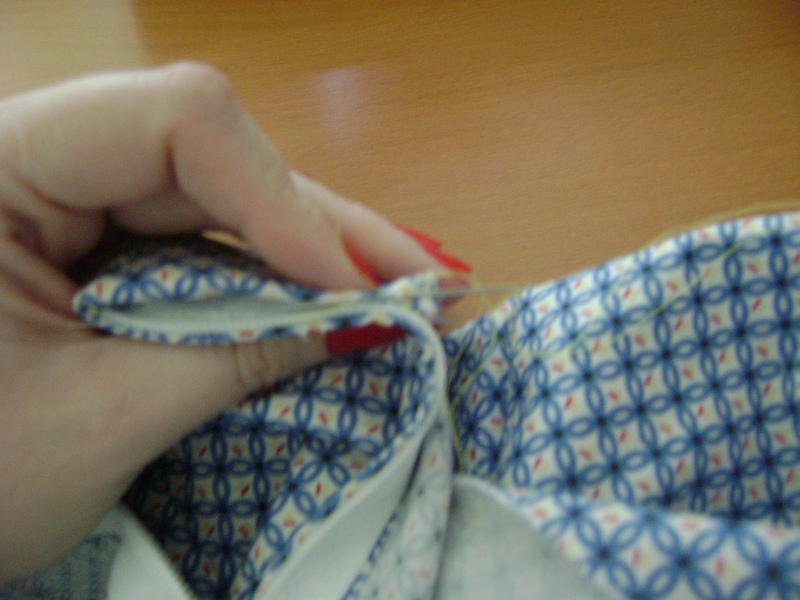 We will also finish the seams to prevent them from fraying in the future. 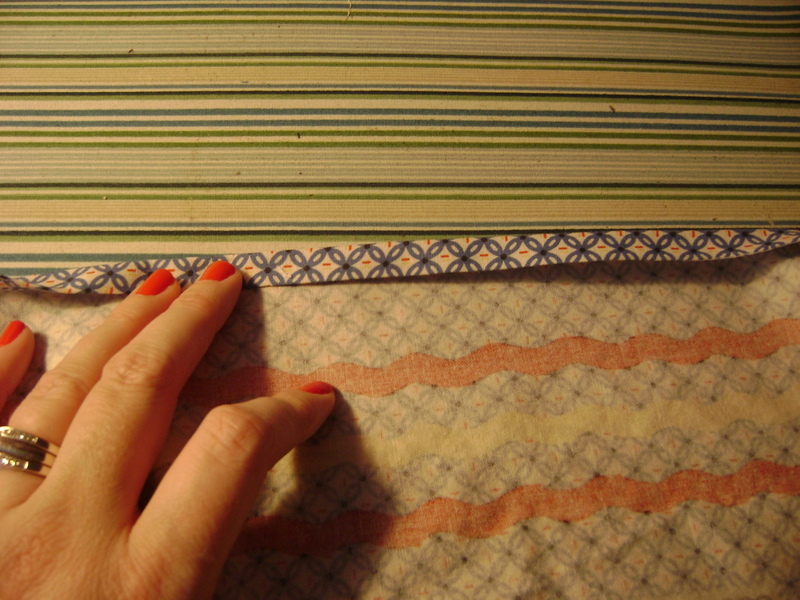 There are so many ways to finish seams, but for this sew along I am keeping things easy. 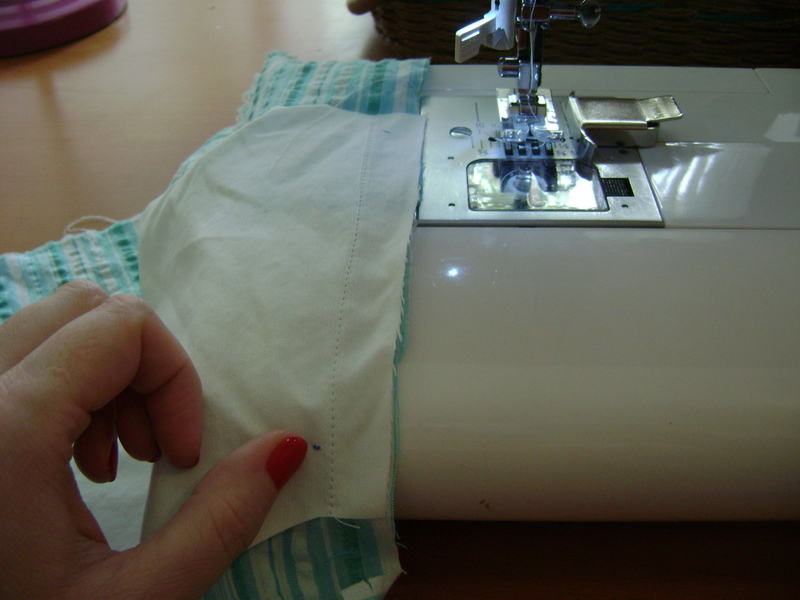 For this step I will show you how to sew your side seams together using the pink skirt. 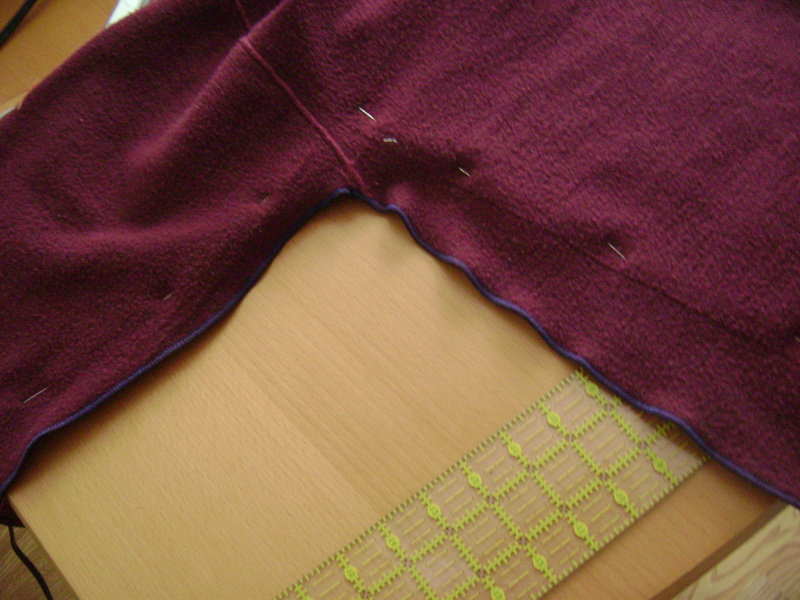 Then we will do seam finishes: the pink skirt is a pinking sheared seam, the blue skirt is a zig-zagged seam. 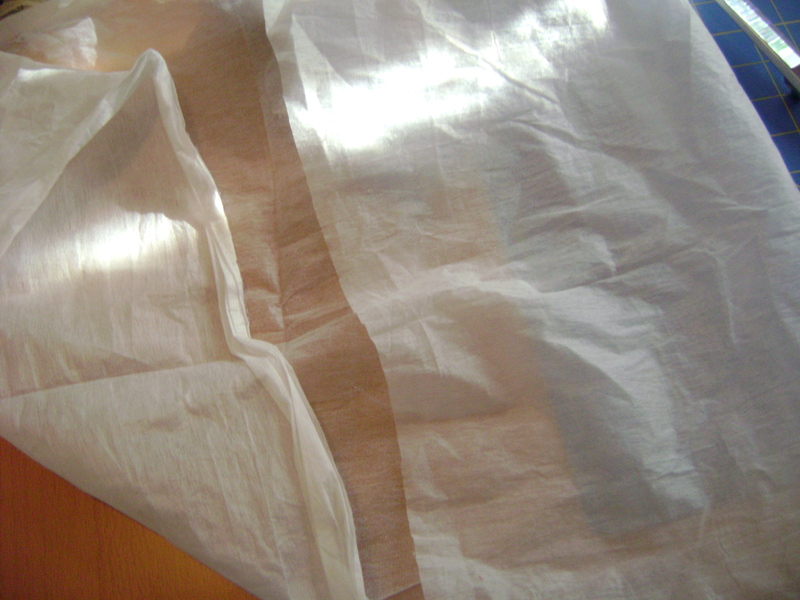 This project would also be a nice one to experiment with a french seam. 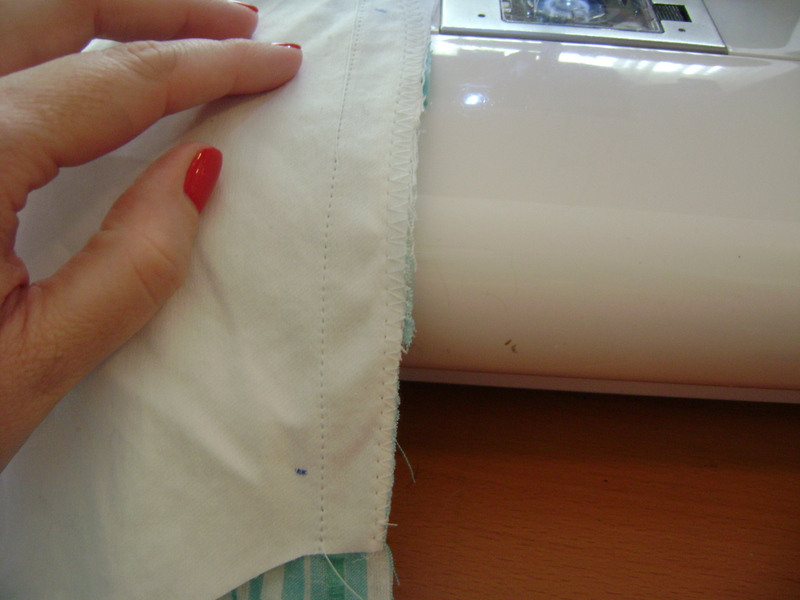 Whichever one you choose, don’t forget to finish the seam under the zipper you inserted. 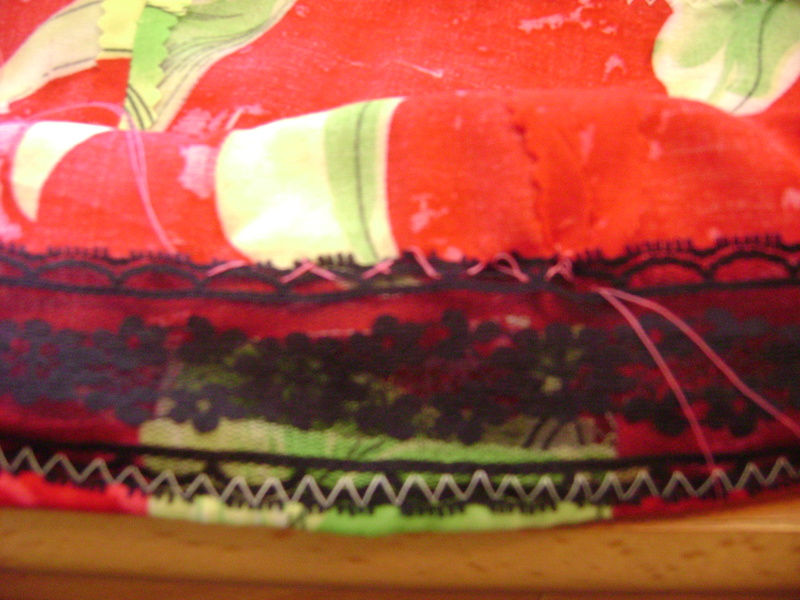 On my skirt I zig-zagged the bottom of the seam and zig-zagged the fabric sewn to the zipper tape. 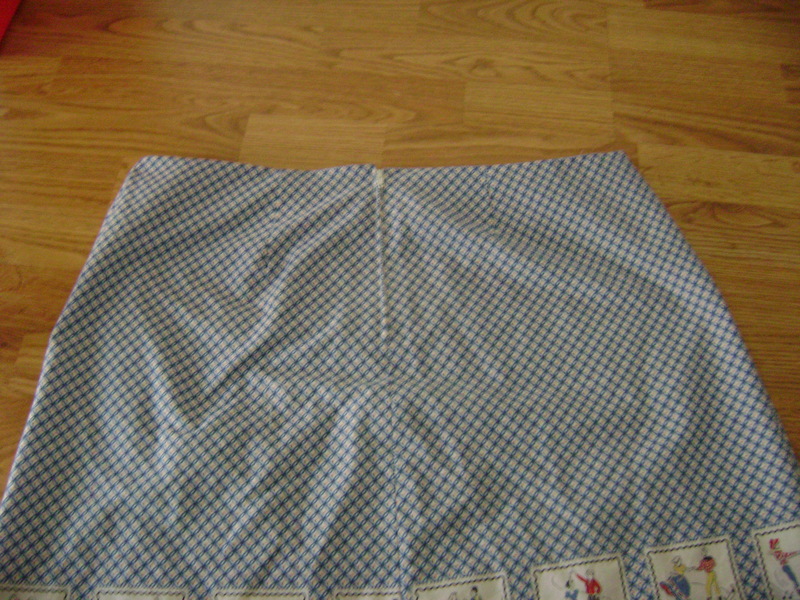 Place the front and back of the skirt right sides together. 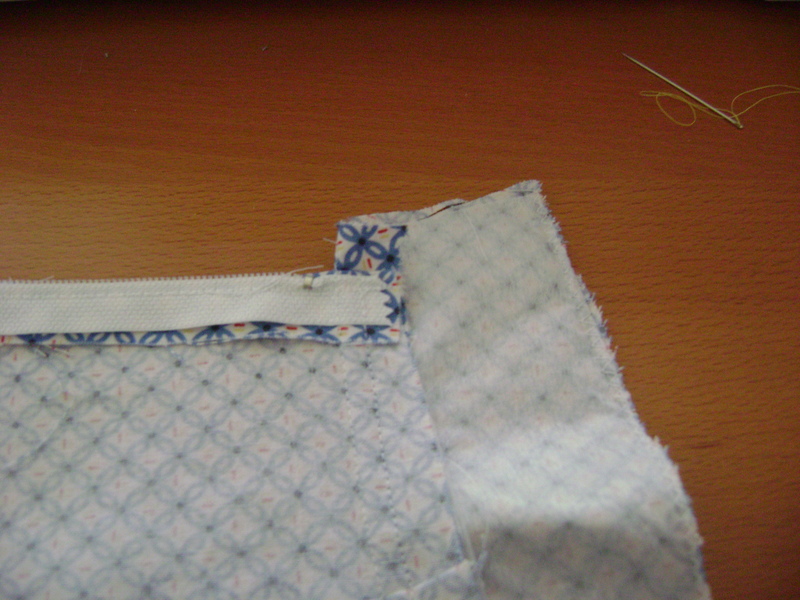 Line up the side seams using the notches you made. You may also pin to help keep them in place while you sew. 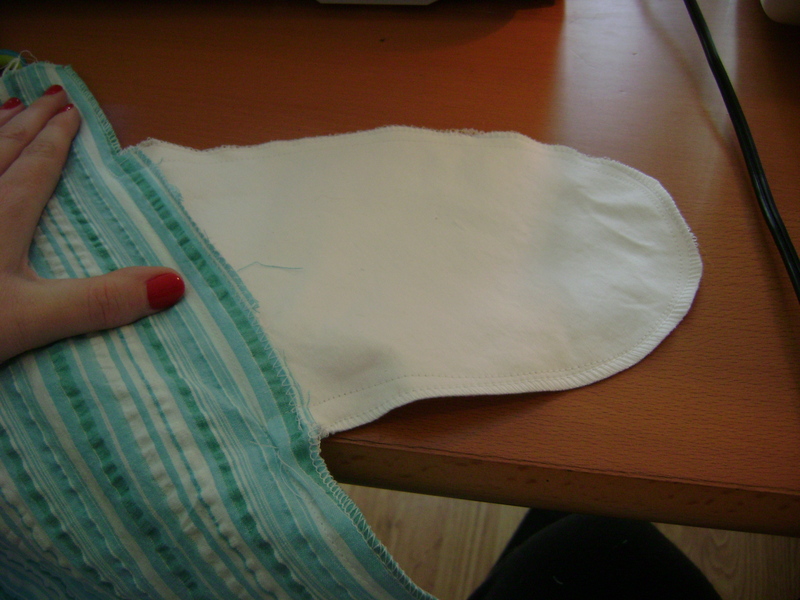 Sew each of the side seams together using a 5/8 inch seam allowance. I use a magnet to help me stay lined up, but you could also just eyeball it or use a post it note as a guide to follow. This is where you will choose your seam finish. Also note, if you would like to carefully try on the skirt to check the fit it is best to do this before you finish the side seams. This will be the easiest time to take it in or let it out as needed. 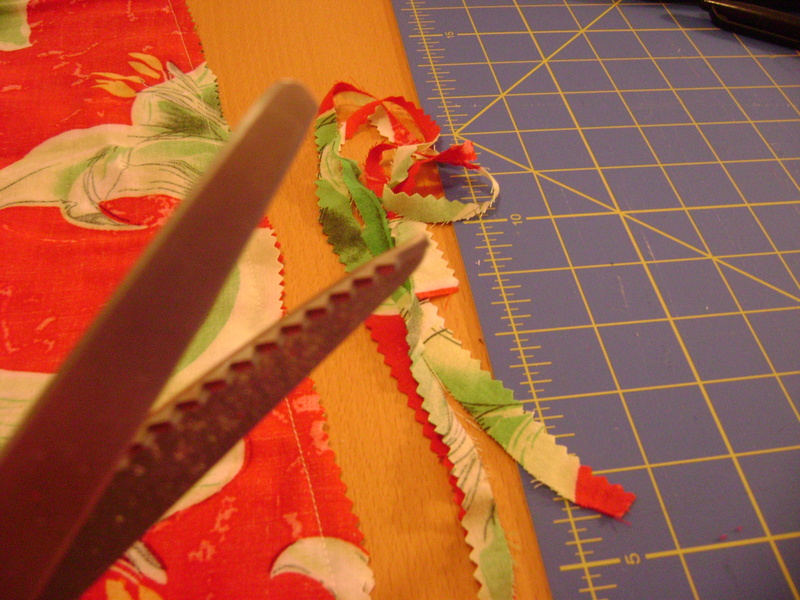 Using your pinking shears trim the seam allowance all the way along the length of the sewn seam. 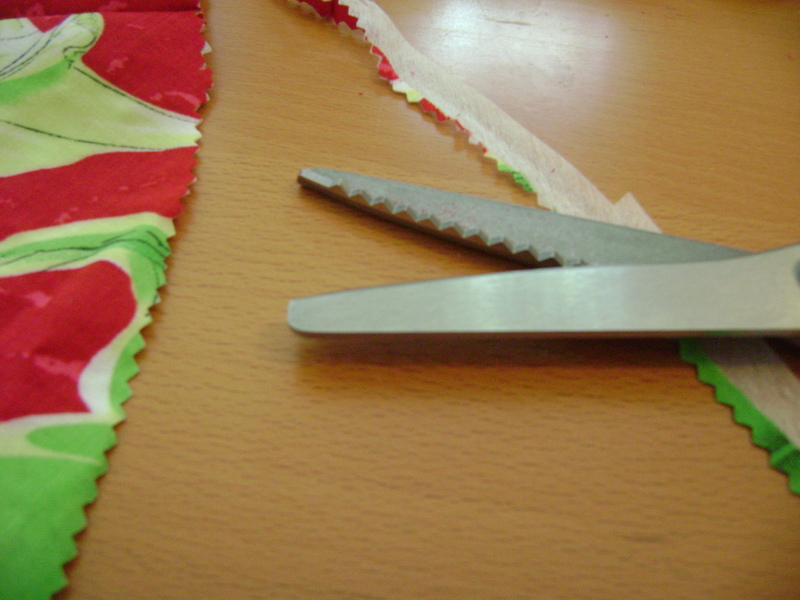 The pinking shears prevent the fabric from fraying. 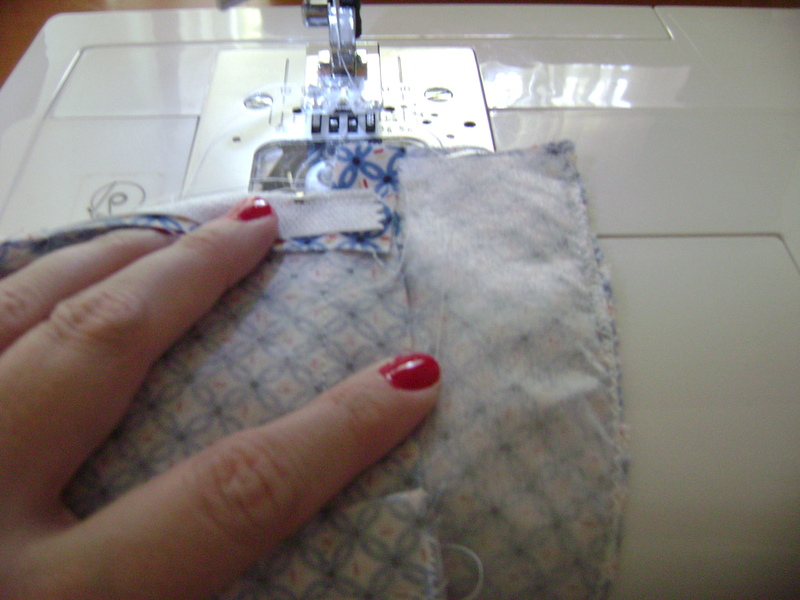 Press that seam allowance open, and you are done! 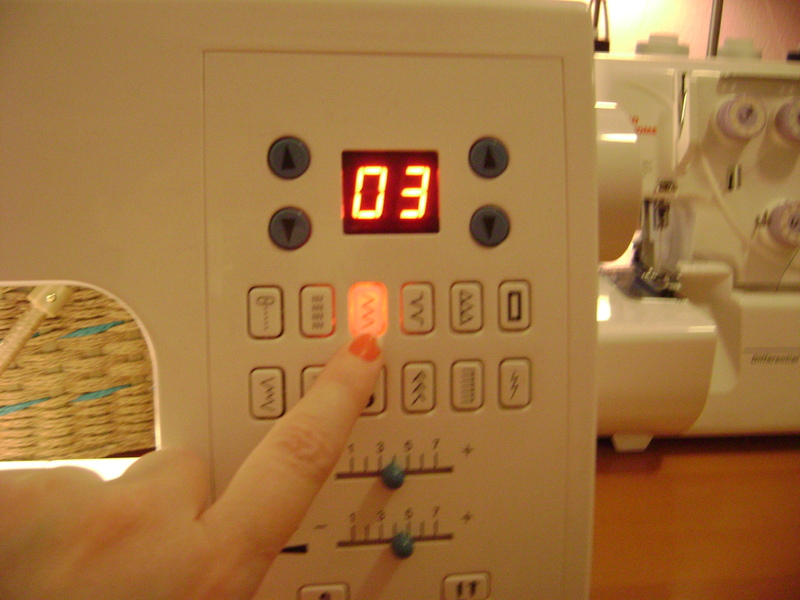 I like to press my seams open first, then to one side. I can’t remember where I picked that up, but it works for me. I find when sewing the more pressing I do the better the results are. I also trim my seam allowances some to prevent them from being bulky. I only trim them about 1/4 inch because you need to need to leave enough left to be able to zig-zag them. 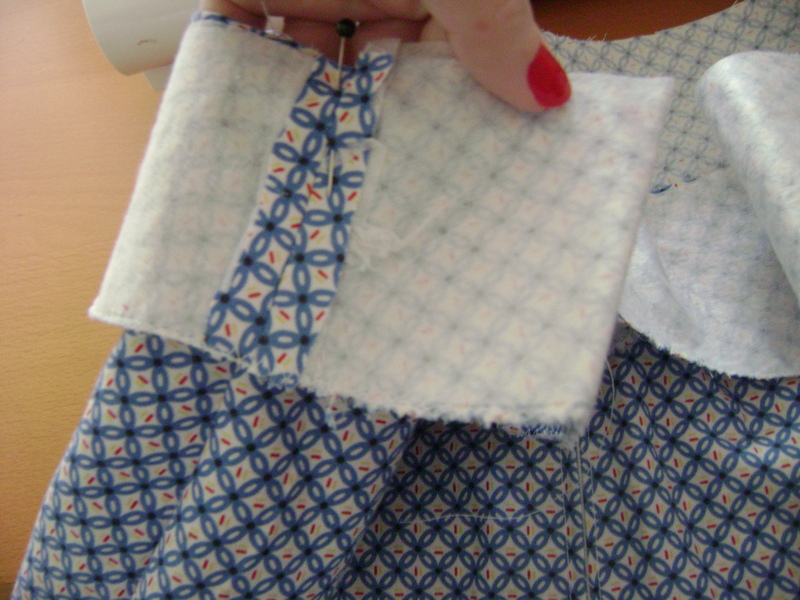 Next choose your zig-zag stitch on your sewing machine. 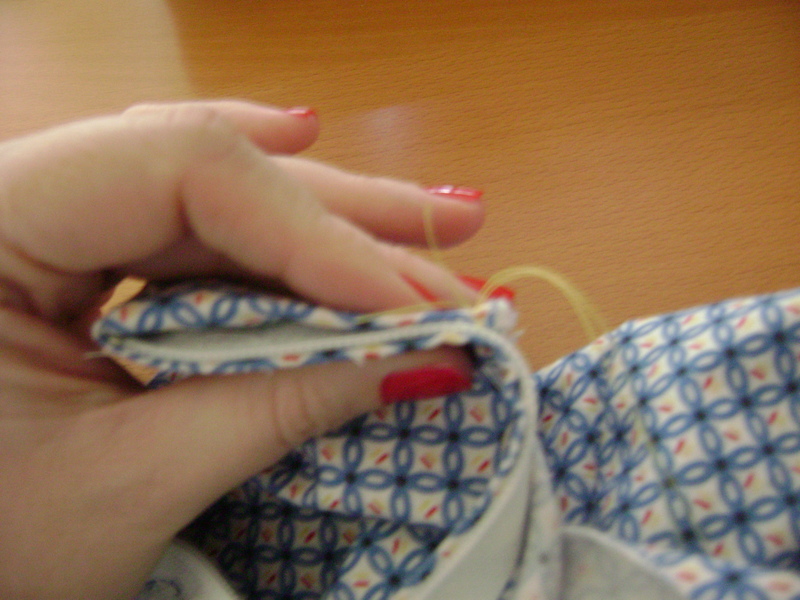 Sew down the length of both seams catching the outside in the stitches. 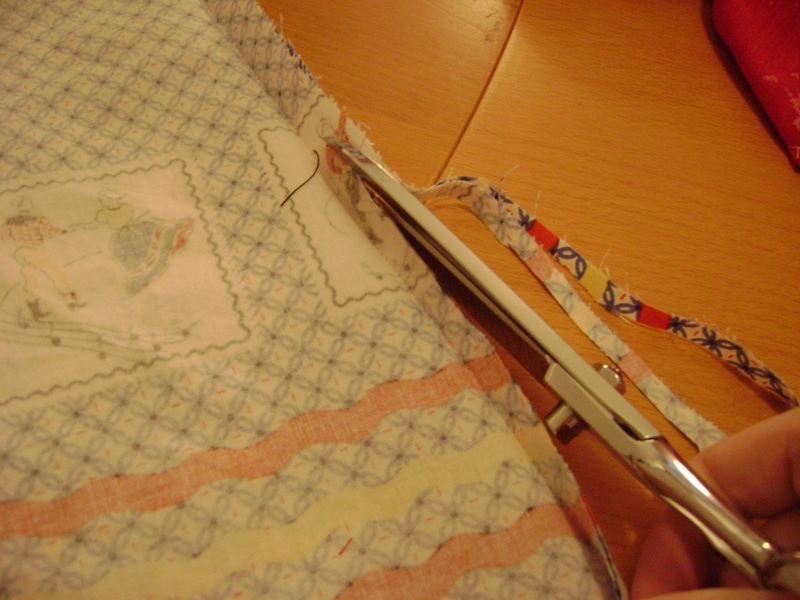 The stitches will form a kind of wrap around the raw edge. As you can see the threads wrap around the raw edge to prevent them from fraying. You have now finished your side seams. Next we will work on the facings. This entry was posted in Clothing, Project Tutorials, Sewing FYI and tagged seam finish techniques, sewing seams on March 18, 2012 by staciethinks.